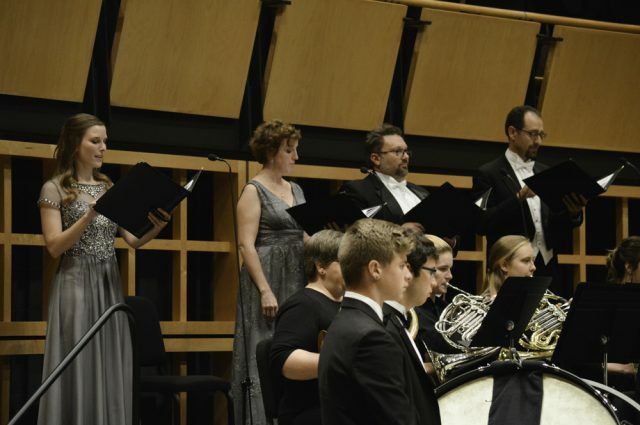 The evening of Oct. 27, the Goshen College Symphony Orchestra and the Goshen Combined Choir shared the stage for a night of music in Sauder Concert Hall. The choir and the orchestra performing together is not new for either group, but is still a fairly unique experience for the audience and students involved, as they do not frequently perform together. The concert began with the orchestra performing two pieces they had worked on for this performance. The first piece was “Overture to West Side Story,” by Leonard Bernstein, played in advance celebration of Bernstein’s 100th birthday on Mar. 25, 2018. The second piece played was “Marche Slave in B-flat minor,” an arrangement written by Pyotr Ilyich Tchaikovsky. A Russian march written during the Serbo-Turkish War. The piece featured sections of both Serbian and Russian music. After intermission, the Combined Choir joined the symphony orchestra to perform Beethoven’s “9th Symphony in D-minor,” one of the most famous and frequently performed symphony pieces. “It was a monumental challenge, both for the choirs and the orchestra to learn and prepare this music,” said Rocha. The message of unity contained in Beethoven’s 9th Symphony is “what we need more of right now,” said Rocha. “I am particularly proud of how the students committed to the music and the meaning of what they were performing,” said Rocha. The orchestra performed three pieces for this concert, and are now preparing new music for other events as well. The orchestra generally learns up to ten songs a semester to perform. This is large time commitment for students who may be members of other musical and non-musical groups alongside their respective course loads. Their next concert will be “A Festival of Carols,” a holiday-themed concert with three performances scheduled to take place Dec.1-3. Tickets for “A Festival of Carols” are available through the Music Center Box Office. Regularly priced tickets are $16. A student discount is available with a valid GC ID.